ALTUS, Okla. – Makayla Mack might just be finding her groove in the Central Plains Region. 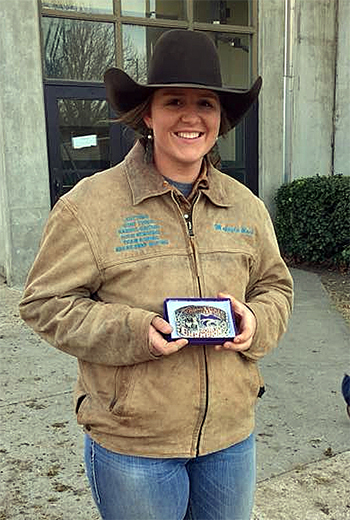 A sophomore from Christmas, Fla., Mack placed in both rounds and won the two-run aggregate title this past weekend at the Kansas State University rodeo in Manhattan, Kan. She earned 155 points and helped the Western Oklahoma State College women’s team to a third-place finish. Those are big statements by the talented Floridian, but the biggest is that she moved into the No. 1 spot in the region with just five events left on the season. “Last semester, I won two go-rounds, which is pretty good,” Mack said. “I’d like to do what I did this past weekend at every rodeo. The average helps boost you up a lot in the standings. If her weekend runs were any proof, she has plenty of things to look back at as she continues to push herself forward. Of course, she leans on teammates and her mentors, like rodeo coach Jess Tierney and assistant Jace Crabb, both of whom have competed at a high level in ProRodeo. “The coaches just give us great support, which goes a long way,” she said. “Jess called before the short-go and told me I had a good calf, and that played well in my mind as I approached the short-go. Of course, part of the performance comes with her teammate, a 6-year-old gelding she has named ADD. He’s also into winning, but he wasn’t the only one. Mack was joined in the championship round by Jayme Flowers, who earned her second run in barrel racing. For the men’s team, Haven Meged of Miles City, Mont., led the Pioneers by making the short round in both tie-down roping and team roping. He was joined in the short round by J.T. Adamson, who split the first-round victory in tie-down roping, while Meged finished tied for third. Meged and header Zane Thompson of Cheyenne, Wyo., placed in both rounds of team roping and finished fourth overall. Those points were critical to Western’s sixth-place finish in Kansas. “We knew we had a good steer in the first round,” said Thompson, the son of Frank Thompson, the 2000 world champion steer wrestler. “Jess and I talked about it, and we didn’t think we needed to be that fast. We just needed to be solid and make sure we got another steer (in the short round). This is a solid start to the spring portion of the season. The K-State event also serves as the halfway point of the 10-event season, so there are plenty of opportunities for the cowboys and cowgirls to move up in the standings. Only the top two teams in the men’s and women’s rankings and the top three contestants in each event will advance to the College National Finals Rodeo, which takes place at Casper, Wyo., in June. It takes a lot of work and a great mental game to earn a spot in the national championship. “It means a lot to do well at the first rodeo, because it gets your spring started off right,” Thompson said. “When you can get the ball rolling, it sure makes it easier to get excited going to the next rodeo.